What’s the perfect accompaniment to a rainy afternoon in Portland? A steamy cup of delicious tea. One of the best places to have one? The Smith Teamaker shop in Portland’s NW Industrial neighborhood. I’d been on a walk, looking for a Stumptown-serving coffeeshop to duck into during another rainy cloudburst, when the Smith Teamaker shop appeared in front of me. Ah, a nice cup of tea sounded like the perfect way to pass some time until the rain disappeared again. The first thing you encounter upon entering the old red-brick building, a former blacksmith shop, is the light, fragrant aromas of the various teas. 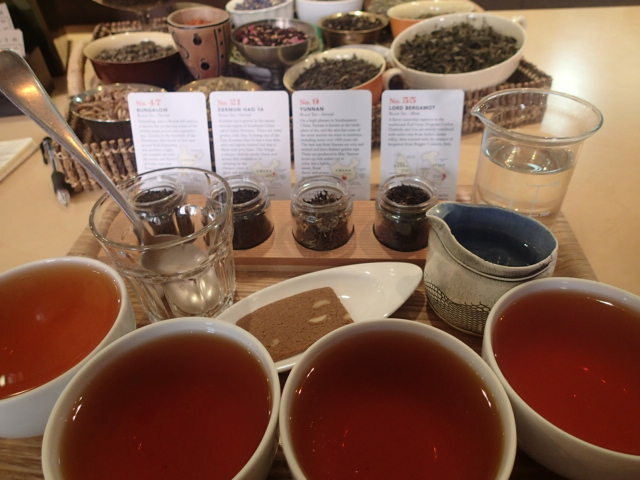 The tasting room’s walls are lined with tins and bags of the delicious teas produced onsite. In fact, Smith’s is the only tea producer in the U.S. that both blends and packages its product onsite. Smith is already a renowned teamaker, as one of the original founders of both the Portland-based Stash and Tazo tea brands, eventually acquired by Yamamotoyama, the oldest tea company in Japan, and Starbucks, respectively. 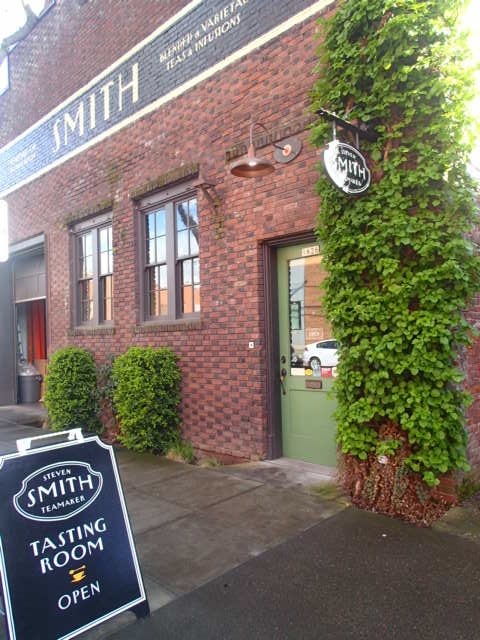 After his former tea companies sold, Smith “retired” to France with his family for a year, but returned to Portland to open this, his latest, venture in 2010. Browsing the extensive menu of both hot (White, Green, Oolong, Black, Herbal-Infused) and fresh-brewed iced teas (Exceptional Black, Fez Green/Mint, Red Nectar) proved daunting with so many delicious choices. While there was a Tea for One option for $3 – or $4.50 for 2 – I opted instead for a Tea Flight tasting of four black teas instead for $8. 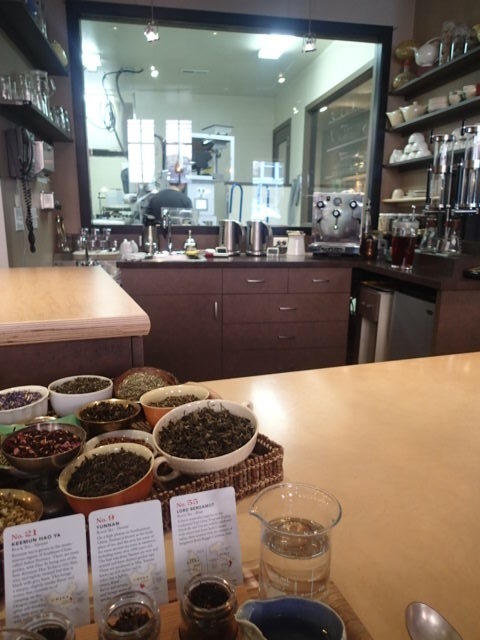 The staff is friendly and helpful, readily explaining the intricate history and process of their wide array of teas and allowing patrons a sniff of their extraordinary blends of choice. Lord Bergamot: The shop’s bestselling version of Earl Grey, a blend of Ceylon and Indian teas scented with Bergamot fruit essence. All four were exquisite, but my personal favorites were the Bungalow and Lord Bergamot, both for their depth and deliciously complex taste. I’ll be looking forward to returning to Smith Teamaker very soon – to while away another rainy afternoon!